Oh, they look like they are doing what the teacher assigned, or they leave the impression that they have gone blissfully to bed, or they sit quietly in the back seat, apparently playing a not particularly exciting video game. ght side, unengaged with her friends, head down. “Poor thing. Something must be wrong at home,” he considers. But he notices that something very different must be going on. He sees her smile. Wait! She’s a Book Sneaker. If you look carefully, you can find these folks, at all ages and almost anywhere. Children are easiest to spot because they aren’t very good at sneaking a few moments to read a book that has them enthralled … yet. Frankie has half-done seatwork sitting on the desk next to his pencil, but Frankie is not doing what was assigned. The teacher looks out over a class of quiet children, pleased at the energy they are focusing on their work. Rising out of his chair, he then notices that Frankie has his head lowered, looking down the front of his desk. “What on earth is he up to? Is he messing with those action figures again?” Nope. Got him! 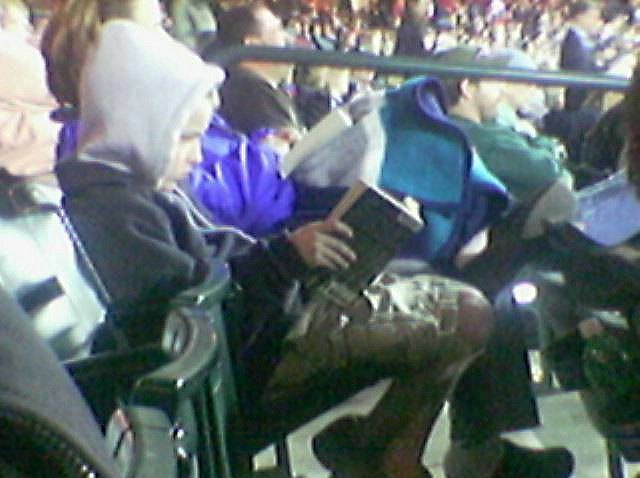 He’s a Clandestine Reader. Adrian was sooo sleepy this morning. No wonder she went to bed early and evidently is totally zonked out. Dad figures he should look in on his little tired sweetheart before he settles down for the night. Easing the door to her room open her father catches just a glimpse of a glowing lump in the middle of her bed. Immediately there is a rustle of the covers, a small click is heard as the now dark lump slowly flattens. The room returns to the shadowy silence he expected. So! She’s a Nocturnal Page Turner. Ronaldo asks his mom if he could play with her phone while they make the ½ hour trip to Aunt Dorothea’s house. “Great idea,” thinks his mother since the baby has already dozed off in his car seat. Ronaldo gets out his ear buds and plugs them into the phone. Then he falls silent. This is not the chattering talk about everything and about nothing at the same time that she’s used to. Seeing his complete focus, Mom reflects about whether he may be getting too much “screen time.” Then she notices that his lips are moving. Ah-Ha! He’s a Back Seat Read-Along-er. These four avid readers have each been “found out” by the adults in their lives. Outside of these all-too-rare kinds of encounters the four kids have been considered by parents, friends and teachers to be completely predictable as generally happy, growing kiddos. If the adults in children’s lives respond appropriately in such moments of discovery, these four youngsters’ surprise behavior could be transformed into the surest path to their becoming lifelong, avid, fluent readers. THAT in turn positions them to be lifelong learners, growing into adulthood eager and able to take over their own personal learning agendas. Right now, they are hiding among us. They choose to take risks and read when they find something more compelling or fascinating than what they are typically offered or expected to do. They choose to read self-selected books because it is more fulfilling and enjoyable than the books that others select for them. These kids just love reading THEIR books. The benefits of that love cannot be overstated. Then we need to HELP THEM, along with all of the other children who could also become avid, fluent readers, to do the same. We need to do this before it’s too late.